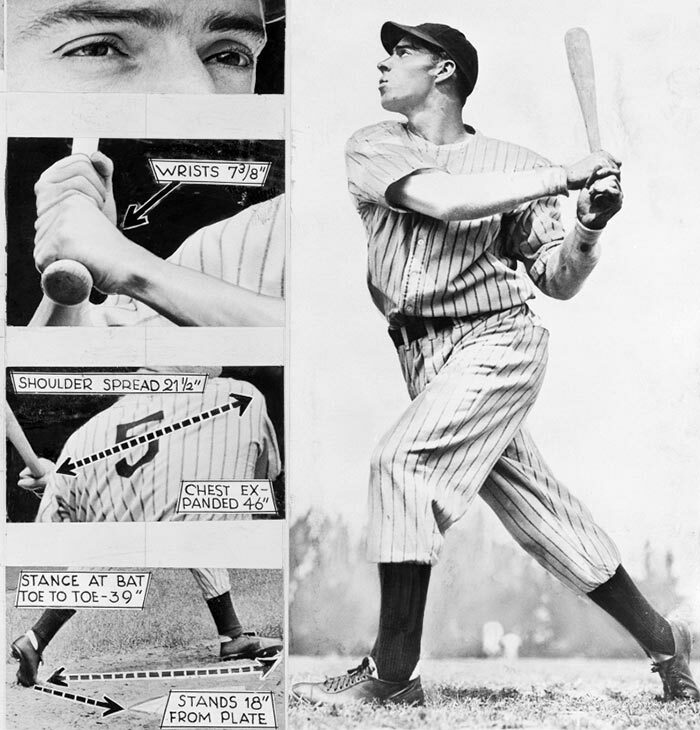 Was Joe DiMaggio’s fifty-six-game hitting streak the greatest feat in all of sports or merely a product of its time? Alfred Hitchcock once quipped that drama is life with the dull bits cut out. Baseball is like that, too, both as a sport and as a nine-inning contest—theatre that is frequently less than spellbinding. Quantum flashes of inspiration occur rarely, amid long stretches of tedium, and so, once observed, rapidly become mythical. For those who love the game, who learn and memorize its historical minutiae like verses of sacred text, the spells of inaction merely underscore whatever instances of transcendence we’re fortunate enough to witness. The deliberation of the game in these moments allows us, even encourages us, to hold past achievements in such high esteem. During one eventful August weekend of this past season, three such moments flashed around North America in high definition, across fifty-inch plasma screens and onto the parchments of baseball history. Alex Rodriguez’s 500th home run and Tom Glavine’s 300th win (traditional Hall of Fame standards) bookended surely the most contentious record of them all: Barry Bonds’s 755th round-tripper, which tied the lifetime mark set by Henry Aaron thirty-one years ago. When, days later, the famously surly Bonds broke the record in front of a rapt home audience in San Francisco, headlines across North America invoked the asterisk some once used to qualify Roger Maris’s single-season home run record (achieved during a longer season than Babe Ruth’s mark). The asterisk for number 756 punctuated several years of debate over whether or not Bonds, whose steroid use was documented in a book by two San Francisco Chronicle reporters and whose personal trainer was imprisoned for steroid distribution, was worthy of the title of all-time home run king. We in this hypermedia age have grown to expect this kind of microscopic scrutiny where our sporting heroes are concerned. But such was not always the case. And though it is worthwhile—and, for fans, fun—to consider every nuance of the astronomically remunerated performances of today, so too does it behoove those of us who love the game to train our lens backward, into baseball’s past. Many records of yesteryear, held to even a sliver of the light we cast upon the modern game, lose their sheen. Consider, for example, perhaps the most venerated record in all of sports, the fifty-six-game hitting streak of Joe DiMaggio. Joseph Paul DiMaggio grew up in northern California, learning the subtleties of America’s pastime alongside his siblings on sun-baked lots in and around San Francisco. Three of Italian immigrant Giuseppe DiMaggio’s nine children went on to play major league baseball: Vince, Joe, and Dominic. And though Vince led the march to the professional game, playing with the San Francisco Seals of the Pacific Coast League in 1932, it was younger brother Joe who was the true prodigy. Having started with the Seals at seventeen, Joe ascended to the major leagues at only twenty-one. When DiMaggio broke in with the Yankees in 1936, expectations were high. One writer observed, “Here is the replacement for Babe Ruth.” DiMaggio didn’t disappoint. His team won five of the next six World Series, and over the course of his career the “Yankee Clipper” established himself as one of the best players in the game. In 1955, he was elected to the Baseball Hall of Fame. But for all his accolades, he is known—most famously and above all else—for his hitting streak in 1941. When the streak began on May 15 of that year, the Yankees had lost four games in a row and seven of the last nine, leaving them five and a half games out of first place. It was time for their better players to respond, and so DiMaggio did. For two full months, he reached base safely in every game, hitting .408 for the stretch, with fifteen home runs and the ludicrously low strikeout total of five. Hoisting themselves onto DiMaggio’s sinewy back, the Yankees vaulted into first place, going 41-13 (games nine and fourteen ended in ties) and eventually ran away with the American League pennant. The streak came to an end on July 17, game two of a series against the hometown Cleveland Indians. It was a muggy Ohio night, yet there were more than 67,000 fans in attendance. DiMaggio had already obliterated the arcane record of Wee Willie Keeler, a 5’4”, 140-pound batsman who in 1897 had “Baltimore chopped” his way to a forty-four-game streak, assisted by the archaic rule that foul balls were not counted as strikes. Coming into the eighth, DiMaggio was 0-for-2 with a walk. He had twice smashed grounders that Indians third-baseman Ken Keltner had turned into unlikely outs. Relief pitcher Jim Bagby faced DiMaggio with the bases loaded and one down. Cleveland, which would end the season twenty-six games behind the eventual world-champion Yankees, was losing 4-1. There was, in essence, nothing at stake but the streak. When Bagby induced a grounder toward his adroit young shortstop, Lou Boudreau, the most extraordinary of sporting feats came to a most unremarkable end: a double play. The streak was over—consigned to the record books, to baseball history, to sporting mythology. There were, from the earliest days, whispers that the streak was not all that it seemed. Given how thoroughly DiMaggio had trashed the old mark, and given that contemporaries such as Ted Williams and Stan Musial—hitters with stronger track records—could never break even the thirty-game mark, skeptics wondered if favouritism had somehow factored in. Indeed, a thoughtful examination suggests not only that the streak as we know it might not have happened, but also how and why such a fiction could persevere. While DiMaggio was grinding through the early games of the streak, America was on the precipice of a conflict involving tens of millions of combatants. Congress had passed the Selective Service and Training Act the previous autumn, and by the summer of 1941 a handful of major-league stars, including Hank Greenberg, had been drafted in anticipation of the United States’s eventual entry into the war. Franklin Delano Roosevelt, a life-long baseball fan, had written a letter in January of that year to baseball commissioner Kenesaw Mountain Landis stating, “I honestly feel that it would be best for the country to keep baseball going… if 300 teams use 5,000 or 6,000 players, these players are a definite recreational asset to at least 20,000,000 of [their] fellow citizens.” The summer of ’41, at least as far as big-league baseball was concerned, was to be business as usual. The distractions of the war combined with the limitations of the media of the times to keep the particulars of the streak from public scrutiny. Though baseball was first broadcast on television in 1939 (a game between Princeton and Columbia), it wasn’t until after the war that telecasts became common. Radio had been integral to the national pastime since the thirties, and by the time war broke out many teams broadcast their entire schedules, but the Yankees were unable to attract a corporate sponsor willing to pay $75,000 to broadcast home games during the summer of ’41. So, short of attending games themselves, fans of the Bronx Bombers could follow the streak only by reading the papers or listening to a nightly fifteen-minute radio re-enactment on wins. Every DiMaggio at-bat not witnessed in person was thus filtered, condensed, and dramatized—fully left to the imagination. As the streak progressed, it developed an odd and frequently misunderstood media inertia. Baseball people had never been especially smitten with the notion of a consecutive-games hitting streak, and newspapers began to keep track of it more as a statistical oddity than as a phenomenon that would immediately capture America’s imagination, as history would have us believe. The New York Times, for its part, never mentioned sports stories on its front page—sports simply lacked gravitas. For accounts of DiMaggio’s exploits, a Times reader had to turn as far back as page twenty-five, after the arts and entertainment pages, then skip past stories on the New York Giants and Brooklyn Dodgers, whom the Times covered with equal vigilance. In less-vaunted publications such as the Sporting News, DiMaggio was feted and lionized, but for the world at large the streak was page-twenty-five news. Even the day after it ended, the front page of the Times paid it no heed. Outside of New York, reaction was mixed. Popular mythology holds that fans in other American League cities turned out in droves—largely, if not solely, to watch DiMaggio extend his record. DiMaggio biographers and many baseball historians seize upon large crowds, such as the one in Cleveland the night the streak came to an end, as evidence of public fervour. Actual attendance numbers tell a different story. Twenty-two of the fifty-six games saw crowds of fewer than 10,000 fans. Game forty-five, when DiMaggio broke Keeler’s record, was witnessed by only 8,682 people—in Yankee Stadium no less. All of 1,625 people witnessed the streak hit fifty in St. Louis. The sellouts noted by history were usually the result of doubleheaders, which drew fans seeking the bargain of an extra game, or contests played under lights, which were still relatively rare in 1941. And though more than 67,000 fans watched the streak end (under lights) in Cleveland, only 15,000 ventured to the game the previous day. This surprising variance in public attention allowed DiMaggio’s streak to progress quietly, and left those who helped perpetuate it to do so unnoticed. In an essay related to his poem “Examination of the Hero in a Time of War,” Wallace Stevens called the poetry of war ‘‘a consciousness of fact, but of heroic fact, of fact on such a scale that the mere consciousness of it affects the scale of one’s thinking and constitutes a participating in the heroic.” A similar myth-making impulse seemed to affect the sports journalists of the era. Reporters who covered the majors back then were not, by today’s measure, real journalists. They were almost like, employees of the teams they covered. As DiMaggio biographer Richard Ben Cramer describes it, “Baseball writers had status, visibility, more freedom than any other reporter, more travel, more good times, and more money… they dined out on friendships with the heroes of the age… and every bit of it [was] on the cuff.” If a player didn’t like you, you’d simply be denied all access to the team. Cramer continues: “The quickest way to lose it all was to run afoul of the fellows in the business—not the newspaper business, but the baseball business.” A writer’s job was to keep the baseball people happy. In keeping with the ethics of the era, Dan Daniel, a popular writer who had been covering baseball since 1909, enjoyed all the perks of covering the Yankees. He travelled with and befriended the players, and had his expenses paid for by the club itself. Daniel was, by modern standards, part of the team, as much a PR man as a reporter. He wrote of DiMaggio extensively, championing “The Big Dago” before DiMaggio had even appeared in the bigs, and it was he who authored the quote, “Here is the replacement for Babe Ruth.” The Clipper made for wonderful copy: he was a good-looking bachelor who patrolled the most revered position in all of sports, centre field for the New York Yankees. Daniel also happened to be the most important witness to the streak. The reason? This friend of DiMaggio and quasi-employee of the New York Yankees just happened, unbelievably, to be the Yankees’ official home-game scorer as well—the very arbiter of hits and errors. For games at Yankee Stadium, Daniel, and Daniel alone, decided if DiMaggio was to be credited with a hit. “In war,” Stevens writes, “the desire to move in the direction of fact as we want it to be and to move quickly is overwhelming.” An impulse no doubt familiar to Dan Daniel. There were instances early in the streak when others noted DiMaggio’s suspiciously good fortune. After game four, played at Yankee Stadium, the New York Herald Tribune wrote, “DiMaggio was credited with three hits on drives manhandled by fielders. Twice he handcuffed the third basemen and the other time Laabs [the St. Louis Browns’ right fielder] must have been worrying about backing into the railing when he let the ball jump out of his glove.” DiMaggio biographers tend to dismiss this preferential treatment, but even DiMaggio acknowledged, in a 1961 article in Sports Illustrated, that he was given breaks by scorers on a few questionable plays during the streak. At the time, however, no one seemed to mind if the hometown hitter was pencilled in for a cheap hit instead of an error every now and again. The standards of the day were simply different. By game thirty, DiMaggio’s streak had reached the altitude at which most succumb. Only a dozen men have surpassed that mark in the past sixty-six years, and only Pete Rose’s forty-four-game run has made it past forty. It was June 17, and the Chicago White Sox were in town for the first game of a three-game series. Just over 10,000 people were present for one of the key moments of the streak. “Old Aches and Pains” Luke Appling was the starting shortstop for the sad-sack Sox between 1931 and 1950. He played more than 2,400 games in his career, all with Chicago, and was elected to Cooperstown in 1964. Although Appling was a great hitter, he was a far-from-stellar fielder, leading the American League in errors six times, averaging an error every 3.66 games, and fielding a paltry .948 for his career, almost twice as many blunders per chance as his contemporaries Lou Boudreau and Phil Rizzuto. A ball hit to Appling, in other words, was anything but an automatic out. In game thirty, Appling’s fielding would prove to be pivotal. “Jolting Joe DiMaggio was lucky,” read the Times’s account. “A ground ball that was labeled an easy out in the seventh suddenly took a bad hop, hit Luke Appling on the shoulder and DiMaggio’s hitting streak zoomed to thirty consecutive games.” More accurately, the hop was adjudged bad by Dan Daniel, and DiMaggio was credited with a hit. The play seemed, to many who saw it, to be a clear error. Hits and errors weren’t indicated on the scoreboard in those days, so some no doubt went home thinking the streak was over. So was the play a fluky bounce? No film exists, and written accounts differ. Many sources describe a “routine grounder” that bounced off Appling’s shoulder after he reached for it (an error of technique that any well-coached Little League infielder would be keen to avoid). DiMaggio’s biographers tend either to avoid mention of the play or to dismiss it as an impossible hop. None of these biographers actually saw the game—indeed, many weren’t yet born. To the retroactive critical eye, it seems suspect that at the very point where most streaks die, DiMaggio’s only hit was a lucky one credited by Dan Daniel. In the twelve games that the Yanks and ChiSox played during the streak, Appling was charged with but one single error. Despite balls literally hitting him in the throat (game twenty-five), Appling’s defence during the streak was adjudged three times more efficient than over the course of his career. And his defensive incompetence in game thirty-one may have benefited DiMaggio even more than in game thirty. Debate rages as to the exact sequence, but the Clipper’s only hit in the follow-up game was either a bloop shot or a screamer that Appling got a glove on, then dropped—twice, according to some. He didn’t bother to make a throw. Again, Dan Daniel was the deciding factor. What’s worrying isn’t merely the possibility that Daniel gave DiMaggio a number of breaks, but that historical accounts of these crucial decisions avoid any meaningful analysis. Rather than discussing potential factors such as a poor fielder and a biased scorer, most rely on a few indispensable adverbs (crazy, bad, fluky) capable of turning a routine groundout into a record-aiding base hit. It took three years after he became eligible for DiMaggio to be elected to baseball’s Hall of Fame. In his first attempt, seven players finished ahead of him in the balloting, including Dazzy Vance, a pitcher with a lifetime record of 197-140, and Ted Lyons, a pitcher who lost 230 games (against 260 wins). By the time of the Clipper’s election in 1955, the scribes had voted five players into the shrine ahead of him. DiMaggio’s legend didn’t really begin building until later, around the time New Yorkers Simon and Garfunkel celebrated him in 1968’s “Mrs. Robinson,” with the lyric, “Where have you gone, Joe DiMaggio? A nation turns its lonely eyes to you.” The next year, a younger generation of baseball writers anointed DiMaggio the greatest living player. Given that his supreme accomplishment had happened nearly three decades before and that the intervening years had produced players such as Willie Mays and Mickey Mantle, it seemed a specious honour, but it was one that DiMaggio and his admirers embraced. Baseball, more than most sports, reflects the times in which it is played. Rules change, ethics shift, and one era’s decisions become another’s poor judgment. Sometimes the judgments of the day are merely questionable; often they’re exercises in hypocrisy. If, in an age when Barry Bonds, a seven-time mvp, can be demonized strongly enough to dull the lustre of the all-time home run record, it seems only fair to apply the same kind of critical scrutiny back through the ages, to re-examine the “great” feats of yesteryear. One can choose to believe that Joe DiMaggio ran the equivalent of a nine-second 100-metre dash in 1941. But to do so one must neglect the fact that his race was timed not by an impartial third party, but by a friend of his—an admirer, a co-worker—and that it took place at a time when America badly needed heroes. Was the streak the most singular sustained accomplishment in the history of sport or the work of a collective imagination seeking a new mythology?